We plan to have busy mornings at the pool and relaxing afternoons filled with books. I’ve created a book list to help guide our book choices. It’s filled with fun and funny books that are exciting, interesting, engaging, and sometimes even silly. 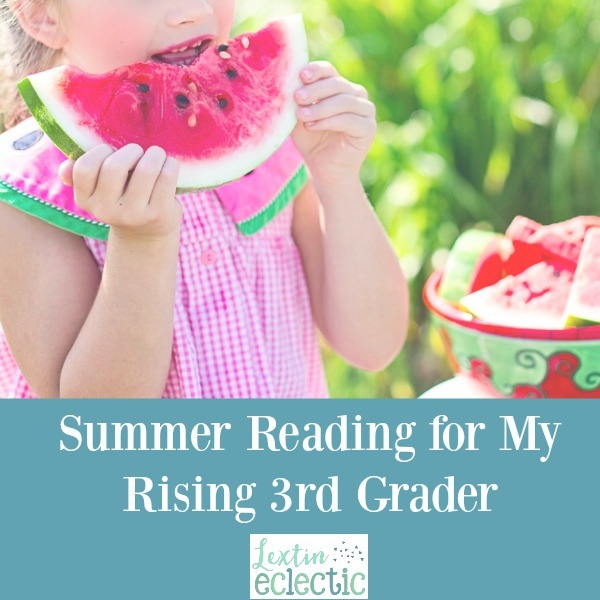 Take a peek into what my rising 3rd grader will be reading this summer. Two girls have very different views of their destinies – one hopes to be a princess while the other dreams of fighting dragons. Turns out that they are both somewhat right in this funny adventure about princesses, dragons, villains, the bond between sisters. This is a rhyming book about a young prince from a very unfashionable kingdom who is invited to a very fashionable ball. Poor Mildred just might be the worst witch in Miss Cackle’s Academy for Witches. Read about her hilarious adventures and her struggles to stay on her broomstick. Phoebe skipped a rock across a lake and hit a unicorn right in the head. She used her one wish to make that unicorn her obligatory best friend, but can they discover true friendship? Harriet is a princess hamster who finds palace life very dull. She is excited to learn that a curse has been placed on her so that when she’s 12 she will prick her finger on a spindle and fall into a deep sleep. This is great news for Harriet who believes she is invincible until her 12th birthday. Barbara and Rick find a wizard in an old bottle and quickly learn that magic can be complicated. They find befriend a sea serpent but how will they keep him a secret? After the children find a mysterious field guide, the Grace siblings discover that there is a parallel world that is both dangerous and mysterious. Anna has trouble making friends so she turns to books to keep her company. However, she soon learns that books can’t be true friends. She will have to learn the meaning of friendship on her own. Three unlikely friends happen upon a dumpster of kittens. They then decide to work together to solve animal crimes. For their first case they try to find out who would want to hurt the tiny kittens. The author of Nim’s Island has written a sweet animal-focused book series for young readers. In this book, two children find a wide variety of pets at the Rainbow Street Shelter as well as an unexpected surprise. Two sisters are waiting for their parents to return from an errand and are captured by pirates and swept into a hilarious and fantastic adventure. Young Princess Juniper wants nothing more than her very own kingdom. For her 13th nameday, her father grants her wish and sends her to a remote corner of the land. However, she soon learns that her father’s kingdom at war and she must form a plan to help. Looking for more reading lists? Try these! Don’t you wish that you got to read all these wonderful books again? Kids have no idea how good they have it. lol Those books look great, a couple I had heard of but the others are new to me. These, plus the ones on your 9 year old boy list, ought to help us get some reading in this summer. Now I’ve just got to find time and books for me! Thanks for the suggestions, they are perfect! Yes! I’m loving all the kids’ books. I try to read a few of them but I’m so glad my kids have time to read, read, read! I need to make a summer list for myself. I have a few books that I’m working on. I hope I have a chance to do some reading myself this summer.